A three sport star at Licking Heights High School in Pataskala, Ohio, the 6’1” 225 pound Ronnie Dawson stood out most on the gridiron as a two-way player at linebacker and fullback. Dawson was recruited by several schools to play football and earned second team All-State honors as a junior in 2012. After suffering ACL and MCL tears however, baseball won out and Greg Beals, the head baseball coach at Ohio State, received the ultimate prize. 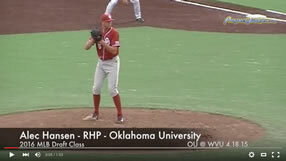 On the diamond, Dawson was lightly recruited and off the 2013 MLB draft radar, but he burst onto the scene as a freshman for the 2014 Buckeyes. Dawson led the team in average, hits, slugging percentage, on-base percentage and stolen bases as a freshman, while starting 53 games on his way to being named to the Louisville Slugger Freshman All-American Team and the Big Ten All-Conference Team. That summer, Dawson continued getting noticed, earning the top spot on Baseball America’s list of top prospects in the Prospect League. Playing for the Chillicothe Paints, Dawson earned rave reviews for his athleticism as he showcased his speed/power combination to the tune of 11 home runs, which led the league, to go with 17 stolen bases. While successful, Dawson’s sophomore campaign wasn’t as gaudy as the previous season. While the Buckeyes jumped off to a hot start and were in contention to host a regional with as little as three weeks remaining in the regular season, Dawson saw a dip in his production, and the Buckeyes suffered a late season collapse that left them on the outside of the regional bubble. While still leading the team in doubles, his batting average dropped nearly 60 points from .337 to .279 and his on base percentage fell from .396 to .363. The dip in production wasn’t universal however, as Dawson’s K/BB rate improved from 2.19 in 2014 to 1.58 this past season and he also increased his home run total from 4 as a freshman to 7 as a sophomore. Dawson spent the summer of 2015 in the Cape Cod League, where he was selected to start in the All-Star Game. Dawson has been great as a junior, improving his numbers across the board while leading the Buckeyes to the NCAA tournament for the first time since 2009 and earning Big Ten Conference Tournament MVP. As a prospect, Dawson is intriguing. That aforementioned power/speed combination is elusive. While he carries his 225 pounds well, the build is closer to thick than what I’d call a traditional athletic physique. With knee injuries in the past, he’ll want to be careful before adding additional bulk so he can remain a duel threat. I expect that the stolen bases will eventually fade, but I see the potential for significant growth at the plate. I watched a lot of prospects during the last two collegiate seasons and none appeared more comfortable in the batter’s box than Dawson. While there’s some swing and miss involved in his game, Dawson has a good feel for the strike zone and doesn’t chase pitches. While showing the ability to hit to all fields, the power displayed is to the pull side with quick hands and a slight uppercut swing. Defensively, I saw a fringy arm with fielding ability that is nicely complemented by good reads and the good speed I mentioned earlier. The arm may limit him to left field as a professional but he diversified his stock by playing some first base last summer. Dawson has a shot to become the highest drafted Buckeye position player since the Tigers selected infielder Ron Bourquin in the second round (50th overall) in 2006.